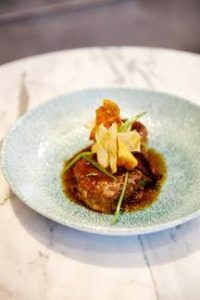 Sophisticated cuisine, glamorous atmosphere and dazzling skyline views are exactly what you’ll find at Ginkgo Restaurant & Sky Bar in VP Plaza España Design 5*, one of Madrid’s newest luxury hotels. 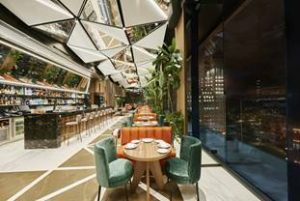 With gastronomy that fuses traditional Spanish cuisine with avant-garde touches as well as a selection of classic and creative cocktails, Ginkgo Sky Bar delivers a chic rooftop experience that is quickly becoming one of the coolest spots in town. 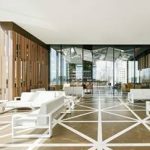 Located on the 12th floor of the hotel, Ginkgo Sky Bar was designed by Studio Gronda, an international design firm in Madrid. This spectacular rooftop oasis has covered and open-air places to enjoy cocktails and delicious tapas as well as a seasonal swimming pool with a transparent floor peering 82 feet below into the atrium of the hotel. Ginkgo Sky Bar provides a nearly 360-degree view of the breathtaking Madrid skyline, the Temple of Debod and the Royal Palace. The menu features Spanish traditional dishes combined with international cuisine and fresh local market ingredients. Starters include Gillardeau Oyster Nº 2 au naturel or with chipotle chile ponzu sauce, Octopus Carpaccio or Futomaki with Salmon, cream cheese and crunchy onion; fresh fish entrees such as Black Cod macerated in miso with potatoes orfried eggs and Delta del Ebro rice; meat entrees like Terrine of Oxtail and Foie with vegetable chips or Sirloin Beef Tataki; and tantalizing desserts including Black Beer Chocolate Cakeand Millefeuille with Asian citrus and fresh creams. Patrons can also imbibe deliciously glamorous cocktails created by trendy mixologist Carlos Moreno of the prestigious Grupo Larrumba. Be sure to try the Daiquiri of the Rising Sunmade with Bacardi rum, yuzu juice, yuzu and ginger jelly plus egg whites or go Around the World in a Gin Fizz of Bombay Sapphire gin, St. Germain, lime juice, orange, yuzu and bitter almond jelly, matcha tea and orange blossom water soda. VP Plaza’s Gingko Sky Bar also offers special music nights. Jazz Nights take place on Wednesdays at 9:30 PM with live performances, while Thursdays, Fridays and Saturdays feature deep house DJ sessions starting at 11:00 PM. 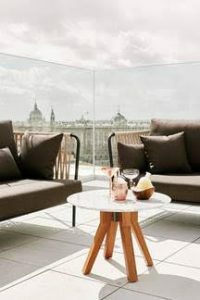 Ginkgo Sky Bar with its trendy vibe and artistic design along with its exquisite cuisine and cocktails, is quickly becoming the most coveted hot spot in the heart of this city renowned for its nightlife. It’s open every day, Sunday to Wednesday from 12:00 PM – 2:00 AM and Thursday to Saturday from 12:00 PM – 4:00 AM.